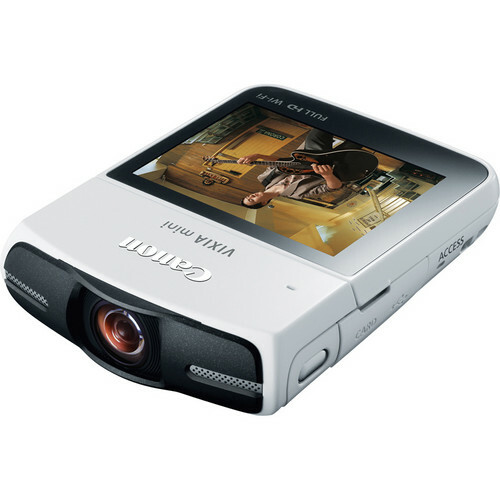 The white Canon VIXIA Mini Camcorder is designed for users looking to share their videos and photos using social media. The VIXIA Mini features a Canon f/2.8 fisheye lens with a 160° viewing angle for video and a 170° viewing angle for photos. You can also choose between a Wide or Close-Up shooting mode. The VIXIA Mini has a 12.8MP High-Sensitivity CMOS image sensor and a DIGIC DV 4 image processor for capturing Full HD video and up to 12MP photos. The camcorder records using the web-friendly MP4 format as well. The VIXIA Mini records directly to a microSD/SDHC/SDXC memory card, and it features built-in Wi-Fi for sharing your videos and photos on social networking sites like YouTube and Facebook. You can use the Wi-Fi to send content to your PC, or you can upload photos and video from almost anywhere with the Canon Movie Uploader app for iOS mobile devices. Canon's CameraAccess2 app supports live streaming by letting you record remotely from the camcorder to your iOS or Android mobile device. The app will also let you control the camcorder from a remote location. The VIXIA Mini has a 2.7" capacitive touch-panel LCD monitor with tilt control. The LCD monitor also supports a Mirror Image Recording/Playback mode. Plus, there's a built-in adjustable stand and a tripod socket, so you can easily capture hands-free video and photos. Some of the camcorder's other features include slow motion and fast motion recording, interval recording, Smart AUTO with 23 predefined shooting situations, Touch Decoration, Genuine Canon Face Detection, Video Snapshot, and new Special Scene Modes. It also features an automatic lens cover and a stereo microphone that will capture high-quality audio to match the quality of the video. Super slim and weighing approximately 5.6 oz (body only), the camcorder's innovative design is perfect for bloggers and anyone who likes to share content online. Shooting is ultra-flexible and can easily be accomplished hands-free. The sturdy built-in stand is adjustable, as is the touch panel LCD, so you can find the exact shooting angle to suit your needs. The wide-angle lens captures expansive scenes as well. Thanks to the VIXIA mini's built-in Wi-Fi, you can also post videos on social networking sites, shoot remotely, and wirelessly stream to mobile devices. The Canon f/2.8 fisheye lens features a 160° video viewing angle and a 170° photo viewing angle, allowing you to capture scenes with everything around you. The wide shots have the outer edge perspective typical of a fisheye lens, shooting at a focal length of 16.8mm for videos and 15.4mm for photos (35mm equivalent). Plus, a centered 1920 x 1440 image is also available to record videos with a more classic look with the Close-up mode, which shoots at 35mm for videos and 32.1mm for photos (35mm equivalent). Shoot in Wide mode to capture an ultra-wide view of the entire scene or Close-up mode to crop-in and emphasize your subject, and quickly toggle from one to the other with a touch of the LCD screen. Wide mode captures virtually everything within its frame, while Close-up mode lets you capture a cropped in, centered 1920 x 1440 image, which is perfect for emphasizing your subject. The best part is that you can toggle between the two modes at any time, simply by touching the LCD screen. Thanks to the camcorder's 12.8MP High-Sensitivity sensor, all images are in Full HD as well. The VIXIA Mini incorporates the most advanced Canon HD Image Processor, the DIGIC DV 4. A significant upgrade on several fronts, the DIGIC DV 4 Image Processor features increased processing power and captures more light, for brighter, noise-free images - even in dark scenes. The VIXIA Mini's 12.8MP High-Sensitivity CMOS sensor works with Canon's DIGIC DV 4 Image Processor to create the Canon HS SYSTEM. With the Canon HS SYSTEM, you'll experience excellent tracking performance even in low light. It will also help you capture clearer images with reduced noise and blur in a variety of situations for high-quality video and photos. The VIXIA Mini captures Full HD video, for smooth detail and superb realism that puts your viewer right in the scene. Video is recorded in convenient MP4 format as well, so it doesn't need to be converted when you play it back on your tablet or smartphone. MP4 format offers the quickest way to upload to blogs and social networking sites. The VIXIA Mini can capture up to 12MP photos as well. The VIXIA Mini records to convenient microSD/SDHC/SDXC memory cards for super high-capacity storage and ultra-fast data transfer speeds. The VIXIA Mini incorporates a high-quality, built-in stereo microphone so no matter where you're recording, you'll be able to capture audio that matches the video quality. Audio Scene Select offers a choice of five audio modes to choose from based on your shooting situation: Standard, Music, Speech, Forest and Birds, and Noise Suppression. Each of these modes has pre-determined optimized settings best suited for the shot you're capturing, resulting in Full HD video with realistic, immersive audio. Audio settings can also be custom set to meet your shooting needs. Built-in Wi-Fi lets you share your video and photos to social networking sites like YouTube or Facebook. You can also use Wi-Fi to send footage to a PC. You can even upload footage from virtually anywhere using your iOS mobile device with the free Canon Movie Uploader app. Videos and photos can be easily shared over the Internet with a free registration on Canon's iMAGE GATEWAY online photo storage service as well. The Live Streaming function enabled by the camcorder's built-in Wi-Fi allows you to receive the live video and sound that your camcorder is recording from a remote location on your iOS or Android mobile device using the free Canon CameraAccess2 app. You can also use the app to remotely control camcorder functions including start/stop and even access information about remaining battery charge, recordable time, and more. The applications for live streaming are vast. You can monitor babies and pets, capture wildlife videos remotely without disturbing the scene, create perfect self-videos, and more. Interacting with your VIXIA Mini will feel familiar right away thanks to the capacitive touch panel LCD. Simply tap and swipe the screen the way you do your tablet or smartphone. The 2.7" LCD makes it easy to switch from shooting video to capturing still images from various angles - low, high, or even upside down. Toggle between Wide and Close-up modes with a simple touch to give your video a dynamic look. Easily scroll through captured images. Tap your way through simple menu options. Quickly share what you've created with friends, family, and the Internet. A built-in, adjustable stand and tripod socket allow flexible positioning so it's easy to shoot any scene hands-free, including self-portraits. One of the most innovative things about the VIXIA Mini is the shooting flexibility it gives you. Between the 2.7" Vari-angle LCD that flips on parallel hinges and the built-in stand that adjusts to various positions, you'll have plenty of shooting options. Shoot low-angle with the screen fully closed and high-angle or straight on with the screen in the rear position. You can even shoot in multiple directions with the camera inverted; Detection Orientation automatically rotates the image for playback. You can also create hands-free videos of yourself by placing the screen in the front position and position the sturdy stand to the perfect angle. There's even a tripod socket to ensure steady recording. With Mirror Image Recording/Playback, the image is flipped horizontally. This lets you view the scene in real time so you can watch as you record. The camcorder also has a repeat playback function that lets you put a single file on a continuous loop for uninterrupted practice. Control the pace and rhythm of your videos with Slow Motion and Fast Motion shooting. Slow Motion is available at 1/2 speed and 1/4 speed. Fast Motion lets you record videos at 2x or 4x regular speed to achieve just the effect you're after. Interval Recording allows you to automatically record still images or half-second video clips at intervals of 5, 10, 30, 60 seconds, or 10 minutes, with playback in flip-book style. Smart AUTO lets you capture clear, bright, well-focused video while the camcorder takes care of all the details. The system recognizes 23 shooting situations based on numerous factors then automatically chooses the optimal settings for the situation. The result is video with better quality in more situations. Updated Special Scene Modes including Food & Fashion, Sports and Macro give you advanced presets to help you capture impressive images even under difficult shooting conditions. The VIXIA Mini's Smart AUTO is at the center of these three Special Scene Modes. Food & Fashion captures colors and textures with beautiful detail and accuracy, even indoors under low light. Sports mode ensures smooth action with crisp, sharp movement. Macro lets you shoot close-up video with vivid color and sharp definition. The camcorder's automatic lens cover helps protect the lens against scratches and dust. Simply power on and the lens cap slides open. Power off and it slides shut, protecting the Canon lens from dirt, dust, and scratches. The same high-quality Face Detection technology used in Canon digital cameras is available in Canon camcorders. Up to 35 faces can be tracked automatically, ensuring sharp focus and natural, accurate exposure. Of the faces tracked, 9 detection frames can be displayed at one time. In fact, the system will recognize faces turned downwards or sideways. In addition, a specific face may be selected as the main subject for continuous tracking. While shooting, Touch Decoration can be activated via the touch panel LCD, allowing you to superimpose and record a variety of fun and exciting images along with your video. Animations such as shooting stars, thought bubbles, freehand drawing, stamps, various decorative frames, and more can be added to give your video some creative flair. Video Snapshot allows you to capture the highlights of a trip or family milestone with the same ease as taking photos. Simply record a series of short video clips - or select your favorite clips while in Playback Mode - and blend in your favorite background music to create an exciting video that will grab everyone's attention. You can choose from 2, 4, or 8 second recording times. Box Dimensions (LxWxH) 6.3 x 5.6 x 2.8"
VIXIA Mini Camcorder (White) is rated 4.2 out of 5 by 33. Rated 4 out of 5 by danfnord from Fantastic Quality, Short Battery Life Image and sound quality here are spectacular, and the wide-angle option makes what'd otherwise be boring talking head style video look more interesting. Only thing I dislike about the camera is the less-than-an-hour of battery life while shooting HD or better than HD. With the backlight and brightness of the touch panel turned down all the way the battery life was still not super. I recommend you get 2 additional batteries with your Vixia Mini. Also, there is an AC power port on the side of the device, I'm now looking to acquire a compatible AC adapter. Rated 5 out of 5 by Bob from I love itf! The Vixia Mini is really simple to use and does an excellent job of recording, easy to upload to youtube and then link to an email or newsletter! I love it! Rated 4 out of 5 by Sam Henri from I'd buy this again and again...however I use this camera for vlogging on my YouTube channel and it's great for that. It fits in my pocket, battery life is great, but I do have a few...ideas. Before I begin, everything I'm about to list have already been fixed with the VIXIA Mini X, but here I go. Firstly, the Vixia Mini has built in wifi to connect to a phone so you can remote shutter or use it as a view finder...if you have an iPhone. Android people are SOL. Next, it has a shutter button on the side of it. I wish it was more tactile and less mushy so I wouldn't keep accidentally clicking it while recording. Also, the photos aren't that great, so having a dedicated shutter button seems a bit redundant. It'd be nice to be able to remap it to be a record button! Canon. Rated 3 out of 5 by scarfey from VIXIA MIINI REVIEW One of the greatest features is the wide angle lens. There are two settings, close and far. Far is handy to film objects that appear at a distance so in a small room you can capture lot's of detail with the effect of filming at a distance. also can position many different angles with the built in tripod. Not so great battery life, no or very poor image stabilation. Rated 4 out of 5 by Steve Nunez from Good for it's design Very small form factor, great typical Canon quality. Would have been great if it had image stabilization and a mic input- but at this price point, can't complain (note: new version does have these things.) The biggest negative is the wide angle only viewpoint: there's a normal mode which seems to be a digital zoom which doesn't look good- it takes a quality hit when used in that mode. Think of this as a Canon Go-Pro and you'll get the idea of this product. Superb sound makes this great for musicians and bloggers. Rated 4 out of 5 by sharon f. from Little Jewel Just in time for Christmas. Compact and easy to carry from one grandkids Christmas program to another. I also am carrying a DSLR so it's nice to be able to stick this little jewel in my coat pocket and go. Buy an extra battery and you will be good to go. Rated 5 out of 5 by Mat from Nice Very nice, love the wide angle view and the built-in stand! Rated 2 out of 5 by Camcorder User from Easy slipped while handling.... Good comcorder with a few sinple function. However, Touch Pad is fair but not as expected. Indeed, it moved while a start/stop of either taking photo, recording video or a turn on/off of power due to its design. This issue is a real problem of device that is designed as a toy. $ of its retail price is not reasonable for this toy. Even if it is designed for an amateur, it should not cause a difficult operation while using a start/stop video and a taking photo unless it intends to design for a toy.Problem is any users should use more presure, for example, while turn on a power switch, press harder on taking picture button and review button, and touch harder on screen at a start/stop butten icon. As a result, picture and video are moved while camcorder is at this moment. A camcorder/camara should not be designed to move at this moment step that should cause a blurred picture. Can you use this camera for Facebook Live? This camera does not stream to Facebook live directly, you will need to connect the camera to a video capture device. Does this come with AC power? Can this camera start and stop recording automatically? I would like to be able to set a start and stop time, and it records between that time period automatically. Yes thru a smartphone plus the Canon CameraAccess2 app.